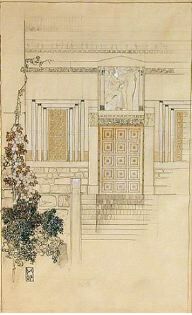 Marcel Kammerer (1878 Vienna--1959 Montreal) was a successful Viennese architect and designer, as well as a painter. He studied at the Staatsgewerbeschule (State Trade School) in Vienna and then at the "Wagnerschule” (Wagner School)—so called because students in this program were under the guidance of architect Otto Wagner—at the Akademie der bildenden Künste (Academy of Fine Art). He received the triennial Rosenbaum Prize at the end of his second year at the Academy for his design for a royal hunting tent. From 1902 to 1910, Kammerer worked in Wagner’s studio, where he became chief draughtsman and participated in major projects such as the Post Office Savings Bank and the Steinhof Church. Kammerer also worked on independent projects during this time. After leaving Wagner’s office, Kammerer joined an architecture and design practice with Emil Hoppe and Otto Schönthal—all three were outstanding students at the Wagnerschule and colleagues from Wagner’s studio. The firm, combining the use of new materials and techniques with an awareness of traditional Viennese architecture, played an important role in the development of Viennese modernism in the years before World War I. These were the glory years for Viennese architecture, and the practice flourished. Among notable projects were the interior design of the Austrian pavilion at the "Esposizione Internazionale d’Arte" (International Art Exhibition) in Rome (1911) and the apartment building at Wiedner Hauptstrasse 126-128 in Vienna (1912-1913). The firm’s work was interrupted by World War I. Kammerer proved unable or unwilling to readjust to the new economic and social realities of postwar Vienna, where the architectural focus turned from haute bourgeois accommodations to public housing. He left the group practice and Vienna for the town of Klosterneuberg, where he took private lessons with the Austrian academic painter Franz Rumpler. While focusing on painting, he continued to take small architectural and design projects from time to time. Following the Nazi annexation of Austria in 1938, Kammerer wrote an official greeting to Adolf Hitler on behalf of the Union of Austrian Artists. Kammerer was named director of fine arts for the Viennese region. He immigrated to Canada after World War II.